The night life in Koh Lipe is suprisingly lively. Not quite as quiet as we expected. The barbeque sizzles in all direction, the aroma of fresh seafood being grilled, with life music here and there make a night stroll down the Walking Street a worthwhile experience. The Eagle just happen to perch on this board. He is so gorgeous, he looked at me as if I was the weird one being there! Plenty of Muslim Restaurants bears the "Halal" sign, most of them do not serve alcoholic drinks, while some does. There is one restaurant called Terbilang which sells the famous crispy bread with multiple flavours, from mango to chicken, to cheese! The most important is it is halal. 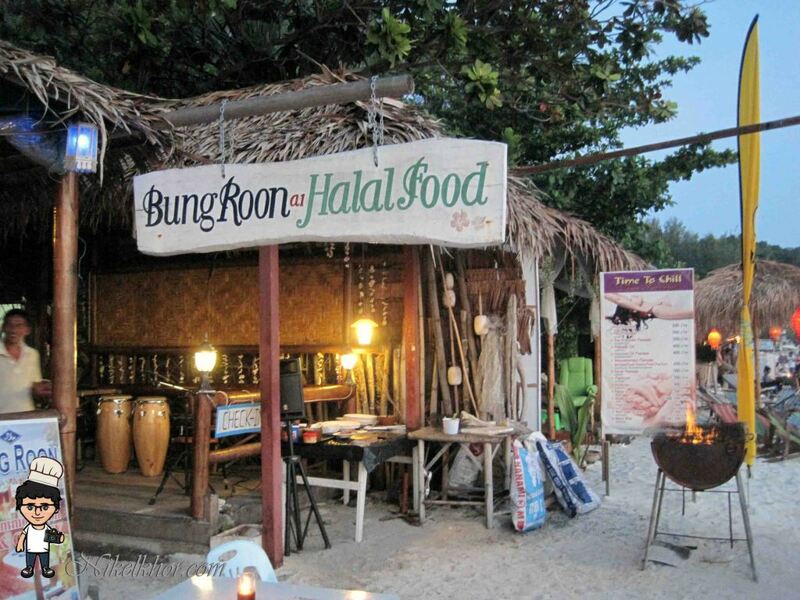 On our last night in Koh Lipe, we chose to have seafood barbeque at a Restaurant called Bung Ron Halal Food. We had lobsters and squid, with some rice & vegetables, and it cost us 1000 Baht. The restaurant operates in a branch along Walking Street during the day, and opens up in another at night time, facing the ocean. The sea was of course pitch black, but the live music, some fire dance performance and glitters from a neighbouring Christmast tree lights added to the romantic ambiance. We tried Thai massage after dinner, which was brilliant to sooth away the muscles pain from snorkeling earlier during the day. My husband requested for a male massage therapist and they provided one. The best thing about Thai massage is that you don't have to take off your clothes for it and it only cost 300 Baht for an hour massage! Value for your money :) Just a nice way to relax before hitting the bed. We couldn't miss the sunrise at the Sunrise Beach for the world. We got up early & after our morning prayers, set on foot to the beach, not before we bought some Halal breakfast from the little shop near our hotel called Sofiyah Halal Food. The only word I can think of the sunrise was breathtaking. Subhanallah I have never witness a more beautiful changing of the night to day. The sun, the sky, the strong wind. Everything was perfect. We checked out at 8am, took the "taxi" to the immigration station & checked in for our 10.30am ferry back to Langkawi. We took some last few shots at this little heaven on earth, and had our very last breakfast in Roti Mina Restaurant. They have fried chicken with glutinous rice for breakfast! So gonna miss this place! This trip had been wonderful and we are looking forward to our next one next year. We can go to holidays every three months or so but the anticipation is what makes it ever so sweet.